Leaking money on Adwords and Facebook Ads? We get it. We can help you. We leverage years of experience with a vast range of ecommerce businesses to help you choose the right mix for your campaign strategy. Many clients find the whole idea of online ad placement intimidating, and are confused by the terminology, and options available to them. That’s where we come in. We’ll demystify the process, analyse your ecommerce business, and make recommendations on the campaign strategy that we believe will best connect your products or services to your target audience. 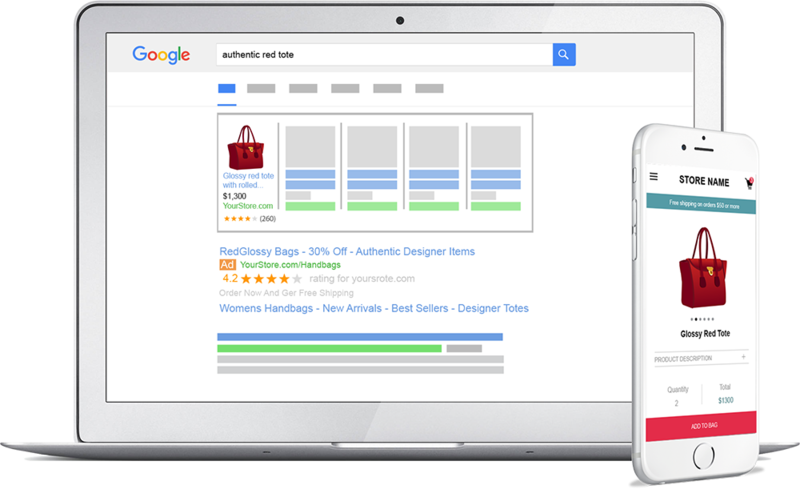 Show product ads on Google and Bing. Make customers return to your online store through an intelligent ad placement they previously showed interest in. Keep your customers interested in a product by placing your ad at the top of their Facebook Newsfeed. We don’t use cookie-cutter techniques, we first learn about your business, find out your goals and set measurable objectives together. We then build a complete strategy and estimate what return you can expect. Know exactly how much you’re going to spend next month, and how much revenue you will generate. You will be constantly informed on how your campaign is doing and will answer to your requests. Ad campaigns are no longer a “set and forget” exercise. We continuously update and optimize your campaigns for you so that you’re always one step ahead. Need custom reports? Want to check your Analytics? Want to improve your landing pages? We have you covered. Our friendly specialists can advise on online marketing issues for ecommerce sites. Adfix has helped us drastically optimize and improve traffic and conversions. The team is knowledgeable and meticulous. Glad to have worked with them for nearly two years. Super responsive. Listens and follows through. I can recommend working with Adfix. They are always very professional, to the point, visionary, helpful and with a good understanding of both my business and the tools needed to succeed. Adfix delivered an excellent service. I felt like I got event more than I paid for! I can certainly say that we had a lot of success working with Adfix. My conversion rate went from 1.55% to 2.65% and that speaks for itself. That’s more help from you in a few weeks than we have had from other agencies in 4 years! We’re ready to help you too. As such, please don’t be intimidated by technical jargon. As a client-centric firm, we are professional, approachable and use plain English. Even if you’re not sure about exactly what you need, please contact us. We’ve carved out a reputation as a progressive, “can do” firm. We’re here to help you to achieve your goals.